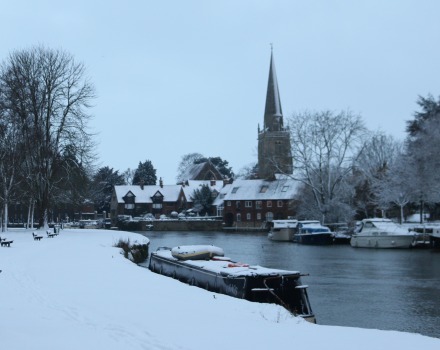 We woke this morning, in Abingdon, to see that everything had been changed by overnight snow. The Market Place was not grey but white. The fields were no longer green, but white, and that made the River Thames look darker. 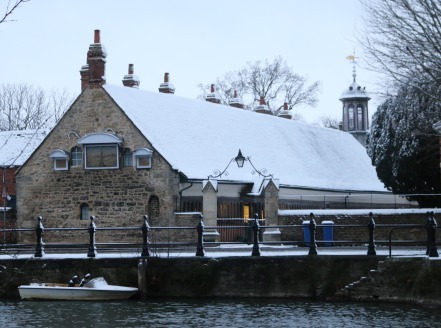 The clay tiles on the almshouse roof had been covered with a layer of snow. 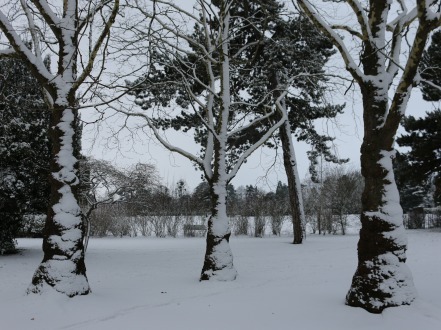 The snow clung onto the side of the trunks of trees. Some people enjoyed the snow. Others were not so sure. It was not only white but also cold and wet and very slippery in places. 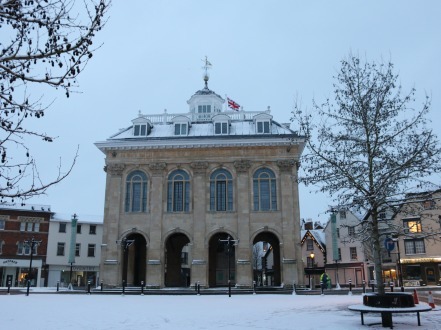 Very soon, however, the town council workmen started clearing the snow by throwing salt on the pathways, across the Market Place. 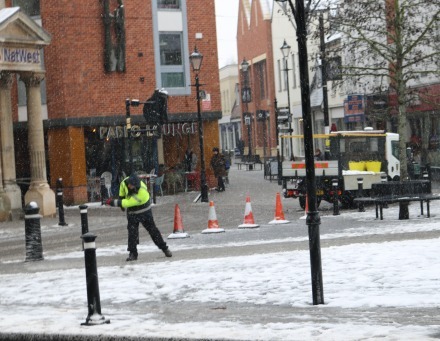 The Vale District Council workers started clearing the snow off some other pavements in the town centre. As a result the recycling collectors did not come and empty our grey bins today. They were probably busy clearing snow. Or maybe they had the day off like some of the schools. More snow fell later during the day. It was not so firm, and good for snowballs, as the overnight snow, and it made the pavements slushy. 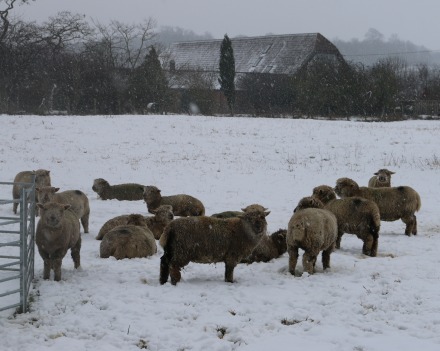 Out in the fields, near Abingdon, the snowfall did not worry the sheep. At 05.30, the A34 was running at normal speeds. While gritting spoils the Christmas card effect, it certainly makes for safety underfoot and undertyre. Even with the midday flurry, we have got away with it pretty well. What I cannot understand is why schools closed. I’m sure it will be Health and Safety, but it seems a bit wimpish to me. Yes ppjs, it is indeed H&S….although I am quite sure that such wimpytude is from ‘the school” but likely imposed by hoops they have to concede to. Plus, of course, teachers come in from near and far….and who knows what the weather may be where they come from? However, having said that, the opportunity to spend a day at home with the kids is exponentially better than dragging myself to yet another soul destroying day of work. The waste collections did not take place today due to the weather conditions and safety of other road users, pedestrians and waste staff. They say to leave out the bins for Monday when they hope to catch up, weather permitting. There is an app on the website that you can download called Binzone that gives information on bin collections. driving from kingston bagpuize to the a34 was a nightmare at 7am – they certainly didn’t grit the a420 properly, no road markings visible, hard to even see where the side of the road was. upon reaching the a34 it was indeed fine. It’s more a mixture of safeguarding – ensuring you have enough staff to supervise, and the bus/coach services deciding not to run that forces the closures rather than just Health & Safety. 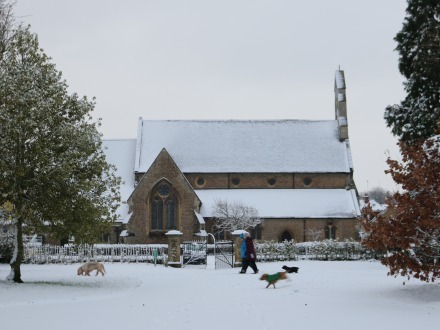 The school where I work did open, but only around 50% came in – we all had a great time building snowmen at break.